Amp It Up! (http://goo.gl/Bsx4K) and read “Tools for living: Prosthetic devices help amputees ‘Amp It Up,’” by Kevin M. Carroll, MS, CP. On page 19 of that issue, there is also a list of funding resources for prosthetic devices. Whatever you do, don’t believe the myth that now that you are an amputee you can’t participate in sports and recreation. You can - if you really want to. Enjoy your spring and summer. Participating in sports and recreation is also a great way to meet new amputee friends and enhance your social network. Amp It Up! is published 9 times a year by Eureka Custom Media, LLC. Editor’s Request: If you haven’t already done so, please help us spread the word about this publication. Simply tell five amputees you know about Amp It Up!, and ask each of them to tell five others about it. By doing so, you will help us grow and become a more effective communications tool for the amputee community. The more people we are able to reach on a regular basis, the more we can accomplish. When amputees need to unite on a political issue; need to learn about an important event; need to know about support groups or peer support services; need to be informed about ways to prevent a second amputation or deal with pain; etc., we can be the vehicle for making that possible. But, first, we must build a regular audience that will help us reach more and more amputees. Spread the word. Help bring this community together to make life better for amputees everywhere. Thanks in advance for your assistance. Copyright © 2013 Eureka Custom Media, LLC. All rights reserved. This publication may not be reproduced in whole or in part, in any fashion, electronically or otherwise, without the written permission of Eureka Custom Media. 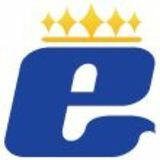 Information in this publication is the responsibility of the producers of the content and does not always reflect Eureka Custom Media’s views. Such information is provided for educational purposes and is not intended as a substitute for professional medical advice. For specific medical advice related to your situation, please seek the advice of a professional healthcare provider. The inclusion of advertisements and articles in this publication should not be construed as endorsement of any product, service, device or company by Eureka Custom Media. n January 26, retired Major League Baseball player Jim Abbott took to Twitter to lend his support to up-andcoming mixed martial arts competitor Nick Newell, saying, “Nothing can stop you! Keep fighting, keep believing. We are all rooting for you.” The young fighter is undefeated as a pro, and was hoping his impressive eight-bout winning streak would eventually carry him into the Ultimate Fighting Championship. That is, until UFC president Dana White flat out said, “Never, no.” Newell, you see, is missing much of his left arm. Not that it would matter to Abbott, who was born without a right hand. “I want people to believe in their ability to accomplish things,” said Abbott in an interview with Rebellion Media. In the span of a ten-year career, Abbott pitched for the New York Yankees, the California Angels, the Chicago White Sox and the Milwaukee Brewers. “I’m just rooting for him on a personal level. To be honest, I don’t know a lot about the fighting world, but people reached out to me and I became a fan. I’ve watched a few matches. Since I heard about Nick, I’ve watched a few.” Abbott retired from MLB in 1999, and includes among his list of accomplishments pitching a no-hitter against the Cleveland Indians in 1993 and working as a motivational speaker after his time in professional sports. There is, of course, the fact that he overcame great physical adversity to excel at the elite level – perhaps his greatest accomplishment of all. a joke, but I didn’t take any nonsense from anyone trying to pick on me. AIU: Have you in some way been able to turn your partial arm into an advantage in MMA fighting? Nick: There are some advantages and some disadvantages. It’s not a risk to grab on the ground, but I also don’t have a left cross. It depends on how you look at it. AIU: Is Ultimate Fighting Championship (UFC) president Dana White still saying that he will never allow you to participate in the Ultimate Fighting Championship or has he changed his mind? Nick: No, that still seems to be the position of the UFC. I’m ready when they’re ready to take me, but they’re still not interested. There’s nothing I can do except keep fighting. I’ve never been one to beg anyone. I know how good I am, and I know what I’m capable of. I’m going to be known as one of the best fighters in this sport and not just as a guy with one hand but as a fighter in general. I know that I’ll have my day, and my time will come. I’m not going to cry and say, “Oh, no, you didn’t want me,” or beg them to let me fight. I’ll fight whoever wants me. I’ll fight for a league that’s going to give me a chance. I’ve done nothing but win and prove myself in the past so I don’t understand why the UFC would say no, but it is what it is, and I’m just going to keep winning and showing how good I actually am. AIU: Any advice for others who might be on the verge of giving up their dreams because of their limb loss or limb difference? Nick: Give it a go. You only know what’s going to happen if you give it a try. A lot of great things have come about from people taking risks. 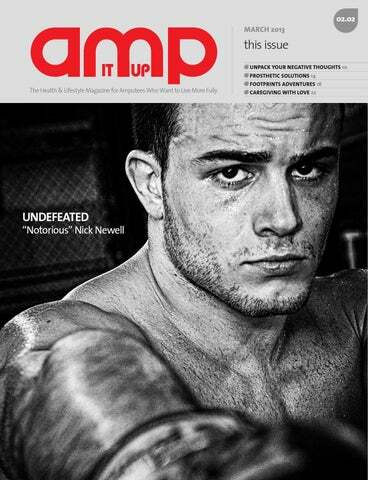 For more information about Nick Newell, please visit his Web site at www.nicknewell.tv/#page_1/. Rich Sainz - amputee and clinical manager for Ability Dynamics - plays at the racquetball clinic in Phoenix. returned from the wars in Iraq and Afghanistan wounded and suffering from amputation, PTSD (post-traumatic stress disorder), traumatic brain injury (TBI), depression and other traumas. As a result, they require intense rehabilitation. Rich Sainz, a knee-disarticulation amputee and clinical manager for Ability Dynamics, says he was able to play racquetball with ease using Ability Dynamic’s RUSH foot, which gives him the flexibility, strength and durability required for high-action sports. “I’m passionate about encouraging other amputees to lead full, active lives,” says Sainz. “My work in the prosthetic industry has been very rewarding, and our company fully supports and endorses the RRC for their groundbreaking work with veterans and amputees.” Retired Lt. Cmdr. (U.S. Navy) Steven Harper, executive director of the MRF and founder of the RRC program, says he is “on a mission to help disabled service members thrive through the game of racquetball.” For more information about the MRF and the RRC program, including dates of upcoming events, please visit www.militaryracquetball.com. ve thoughts pull of the Earth. Worse, by not acknowledging them, I was unable to examine them and gently let them go. The original title proposed for this article was “Go Ahead - Commit a Murder Today! Kill Those Destructive Thoughts That Are Holding You Back.” While I liked the catchiness of the title, I had just finished listening to a talk on self-love and how love begins with acceptance. We don’t do battle with ourselves. We accept it all and then gently introduce a desire to change. I like to practice a meditation designed by Belleruth Naparstek that has this wonderful affirmation: “More and more I can acknowledge whatever I feel as my inner truth of the moment.” This isn’t wallowing; it is validation. To further explain this shift in thinking, I’ll address five common thoughts that have the potential to obstruct our growth and happiness as amputees. If you’ve ever had any of these negative thoughts, you’re not alone. Like the famous quote about courage not being the absence of fear, positivity is not the absence of doubt. We feel the fear and pain before we choose to think differently. unconditionally? Remember: Everyone feels broken and unlovable in some way, at least some of the time. about where I am while still maintaining a vision for where I want to be. If you base all your goals on getting back to where you used to be, you might be missing the opportunity to discover a new path. resources and know your rights. 4. “I’ve lost a limb. My life is over.” Are you still breathing? If so, it’s not over. I’ve been an amputee for 12 years – almost my entire young adulthood. Those years have been full of life. I traveled all over Europe, went to college, sang in a cathedral in New York, adopted a kitty and a puppy, learned to cook vegan food, fell in love, and so much more. And my dreams continue to grow each year. You are the only person who decides what limits get put on your life. Will there be tough and frustrating times? Yes. Your prosthesis will break on the only day you go for a hike without your phone. You will have to ask for help. You will have to do some things differently. People will make hurtful, insensitive comments or pester you with the same old questions. Yet, you are still the only one in control of what you will do with it all. As amputees, our challenges are very visible, but don’t forget the insightful words often attributed to Ian MacLaren: “Be kind, for everyone you meet is fighting a hard battle.” No matter what happens, as long as you are breathing, this life is yours to design. Feel the frustration, and then act anyway. 5. “I’m not doing it perfectly so I should just give up.” No one is doing it perfectly. As a recovering perfectionist, I need to regularly remind myself of this ultimate truth. One great way to remedy this thought is to be open and honest with everyone around you. Honesty is usually rewarded with honesty. In our society, we tend to lie to cover up our insecurities and fears. We all walk around saying we are fine. Own your story. seemed like a worthwhile goal, and it has been achievable. Now, don’t get me wrong. There are some excellent single-handed sports folks out there. There are those like Jim Abbott of baseball pitching fame, but that’s not where we wanted to go. My educational background in engineering, biology and physiology and my training as a recreational therapist influenced me to look at more therapeutic approaches to prosthetic design. Being bilateral and bimanual is better for your spine and overall skeletal and musculature health than being purely single-handed. Bilateral challenges might even influence brain stimulation. The reality is that we who are single-handed experience enough overuse syndrome already. Not everyone has a choice, but most people with an upper-extremity absence can choose to function bilaterally with a prosthesis and perform better than they would just using a single hand. For some activities, it is almost necessary to operate bilaterally. Ever try to kayak single-handed? at speeds of more than 50 miles per hour and farther than 30 meters with accuracy. The experience has been overwhelming, truly astonishing and rewarding. So we now can offer the COBRA Baseball Throwing TD. Never in the history of prosthetics, to the best of my knowledge, has such a thing been accomplished. I believe that the COBRA is a revolutionary step forward in upper-extremity prosthetics. But don’t believe me. It’s available to check out for yourself. Check it out, and I believe that you will be as amazed as I have been in being able to “throw again.” Finally, if you have an innovative idea that you think deserves to be further developed, please get in touch with me. I’m glad to be a resource to anyone with a prosthetic challenge or new idea, and I will respond to your e-mail. Become two-handed again, and play hard! For more information about adaptive devices, please visit www.oandp.com/ products/trs/. Bob Radocy is an active amputee who is missing his left hand. He has been designing highperformance prosthetic components for 30 years and is the president and CEO of TRS Inc.
What is Footprints Adventures, and what does the organization do? Brian: Footprints Adventures is an adventure travel camp specifically designed for teens and adults with limb differences and limb loss (amputations). The organization leads programs in the outdoors where participants have the opportunity to go whitewater rafting and rock climbing, be challenged on a high ropes course, and participate in many other activities while camping out the entire week. Why did you start the organization? learned tremendously while bringing adventure back into his life during his recovery process. Despite the day-today challenges Brian faced, he was able to see past his disability and find the right adaptations to get back into the adventure activities that he loved before his accident. As a result of our desire to offer others the chance to experience the same feelings and growth that we have experienced, the dream of Footprints Adventures became a reality. Brittany: The mission of Footprints Adventures is to promote self-advocacy, personalreflection and self-confidence among teens and adults with limb differences and limb loss; and to challenge them to set new physical goals through fun and adventurous activities. programs, sponsor people to attend an adaptive sports conference, and run sessions at other conferences to raise awareness of Footprints Adventures. How many people do you believe the organization has been able to help so far? Brian: Footprints Adventures has continuously increased its impact on participants while getting its name out there. The organization sent four people to an adaptive sports conference in 2011, took five people on a seven-day camping trip that same month, and added more participants to its program in 2012. By working to fill two travel programs this summer, to send five people to the adaptive sports conference again this year, and to run sessions at an adaptive sports competition, Footprints is continuing to reach out to help people. What’s the best thing someone has told you after he or she participated in a Footprints Adventures event? What does it feel like to make a difference in other people’s lives? Brian: It feels good and not just your “I feel good today” kind of good. It is a feeling all its own. It is as if you had to combine all of your other “good” feelings to make one. It is much more because this “good” is warm and fuzzy; it is full of pride, excitement, confidence, empowerment and compassion. Whenever I think about the programs that I have done and the participants, it makes me smile, even after a long hard day at work. That’s what it feels like to run this program and make a difference in people’s lives. What is your vision for the organization’s future? Brian: Footprints has a bright future, one that we hope is full of growth in programs with international destinations and year-round programs. If you could do one other thing with the organization, what would it be? Brian: Footprints would love to use itself as a platform for cancer awareness as a majority of the participants in the program who have amputations are survivors of cancer. How can others help Footprints Adventures fulfill its mission? participants in the adult program in July. To help us meet this goal, please join us this summer on one of our adventures, and tell everyone you know to check out what Footprints is all about. In addition, donations always help a nonprofit. We accept monetary donations, but you may also donate your used car, and the proceeds of its sale will go to Footprints. Also, if you are able to donate gently used outdoor gear, a cargo trailer, or a 12- to 15-passenger van, it would be greatly appreciated. All staff members at Footprints Adventures are currently volunteers. They work full-time jobs and take their vacation time to run, orchestrate and prepare Footprints programs. Footprints would love to see the day that our very generous staff members get paid and can be available full time to reach out to more people. What advice would you give those who want to do something to benefit others? Brian: If you know something in your heart, follow it. It is very rewarding. Come help us, and feel how much it changes your life. Is there anything else you’d like to tell people with limb differences or limb loss about Footprints Adventures? Brian and Brittany: Our motto is “I do what I can … with what I got!” No matter what challenges you have been through in your life, life is not over. Come to Colorado, join the Footprints Adventures family, and see for yourself what you are truly capable of. How may a person get more information about Footprints Adventures? more information and to fill out a registration form. They may also call us at 720 445-5238 or send us an e-mail at footprintsadventures@ gmail.com. Whether it’s your wife, husband, child, another relative or close friend you are caring for, it is paramount that you become the best caregiver possible for your loved one. As a caregiver for my wife, Jacqui, during her brave journey to beat aml-leukemia, here is what I learned and can share as I honor and applaud caregivers everywhere. Be the trusted advocate. No matter the illness, the medical journey to heal is lengthy and complicated, especially if the battleground is cancer. It is important to make sure that you - the caregiver - understand the treatment that the doctor has initiated, no matter how complex, and that all questions have been answered, including the many what ifs and whens. If you need to research various options or get second opinions, make it happen. If you need a clinical trial, find it. If the patient is overwhelmed or can’t focus, he or she must feel and know the caregiver is the responsible advocate and is knowledgeable of the best possible medical journey. If so, the patient will feel protected and loved, and thus empowered to just focus on his or her part: the healing. Become the cocoon around your loved one. Every day, I’d get into Jacqui’s bed and we’d hug tightly as she’d wrap herself around me while we chatted or napped. I always made sure she felt totally surrounded, completely cocooned, by my love, my strength, and my positive attitude. As a caregiver, you have to supply that grounding, that safety net. No matter how bad or creepy or doubtful a patient may feel, you have to provide an unconditional, unbending, concrete tower of absolute certainty about positive progress, as well as an ocean of love that will not allow anything to happen but the very, very best. As caregiver, you must be the unmovable rock of strength and security. A granite-strong cocoon! Don’t just be present. Be a partner. You need to work as a team member, in partnership with the patient, to be there and support him or her with any and all treatments, from MRIs to IV-line cleanings. Whether double-checking with the nurses about the drugs they’re hooking up, making sure the bed is made or freshened while the patient is in the shower or bathroom, scheduling the physical therapists to keep your partner active and limber, or dealing with the three meals and snack orders, you are there to deal with the many details that make up daily hospital life. An unspoken team partnership is crucial for caregivers to bring to the table and for patients to rely on. It was my commitment to make sure Jacqui felt her partner was engaged with the journey 24/7. She knew it, she felt it, she counted on it. Keep them active and involved. Sometimes it’s just being there to open the shades and point out how beautiful the sunrise is that morning. Sometimes it’s sharing an important front-page story in the news or breaking out a favorite game like Yahtzee to encourage the patient’s competitive spirit. Sometimes it’s playing a CD of oldies but goodies and getting up to do some crazy dance steps to get a laugh - or, better still, to get the patient to dance even if it means she must stand on your feet because she can’t stand alone.When you’re ill, the world feels like it’s closing in on you. It’s important for the caregiver to keep enlarging the boundaries and keep the patient involved with the outside world. Jacqui, who worked in women’s retail and was not familiar with daytime TV, really enjoyed watching Ellen when I started putting it on as she saw women celebrating life … laughing and dancing every day. The will to live and being active with the outside world is crucial therapy. Arrange for small doses of one-on-one time with special friends and family. Your loved one values friendships, and some concentrated time with a dear friend or family member can be restorative. Have a special friend come over for 10 minutes to an hour (depending on how your loved one is feeling that day), and occupy yourself with a task nearby. This way, you can be summoned easily if needed, but they can still have some privacy and a small sense of normalcy. And if you need to regroup, grab a coffee with a friend or get on the phone with a college buddy. Do whatever it takes to remain strong, clearminded and balanced. Your own good mental outlook is crucial to your partner. The caregiver must become the dependable all-around partner for the patient. If you can do that effectively and incorporate these five tips, the patient can relax as he or she heals and know that the train has a co-driver and all is well with the arduous journey. The more you take on your shoulders, the less remains on the patient’s. Needless to say, this includes everything else going on with your home, financial concerns such as paying monthly bills, and keeping family and friends informed. I was busy, as all caregivers are. And every single day, I am deeply grateful for Jacqui’s healing. Guy Magar, a TV and film director/writer/ producer, has worked for more than 30 years in the motion picture industry. His credits include Battlestar Galactica, The A-Team, La Femme Nikita and Children of the Corn: Revelation. He is the author of Kiss Me Quick Before I Shoot: A Filmmaker’s Journey into the Lights of Hollywood and True Love (www.kissmequickbeforeishoot.com). May/June Extremity Games 8 Motocross Baja Acres, Millington, MI Main Event Texas Ski Ranch, TX For more information: www.adnpage.org www.extremitygames.com 248 829-8353 Be sure to verify event dates and venues with the hosting organization to make sure that they have not been changed. Body Power vs Bionic . . . There is no contest! . . . exceeding the challenge. Investigating the effects of limb loss or congenital absence on behavior and the brain to improve patient care and rehabilitation. This project will use behavioral tests, Magnetic Resonance Imaging (MRI) and Transcranial Magnetic Stimulation (TMS) to investigate brain activity during movement and sensation. Results may have implications for improving rehabilitation techniques. Participants must be 18 - 70 years of age, and in good health with no history of neurological or psychiatric illness. Volunteers will receive $30/hr. for their participation, as well as reimbursement for all travel expenses. This research is funded by grants from the National Institutes of Health and Department of Defense.